Ryan Blaney and Justin Allgaier will lead them to the green flag. It’s a 100 lap event at Indianapolis. Green flag, both front row machines get a heavy push at the line. Sadler pushes Allgaier to the lead on the outside lane. Blaney has fallen to 8th on the inside lane before they complete of lap one. Lap 4, the top 3 run nose to tail. Allgaier leads Sadler. Hemric is aggressively looking for a way by. As they sort it out, six more cars join the fight. Hemric made a bold dive to the bottom, Sadler holds him off on the outside. Lap 9, Ty Dillon and Cole Custer head for the pit lane. Lap 11, the competition caution is out. Tyler Reddick is the first car to the pit exit with just two tires. Allgaier is first off with four. Green, Ty Dillon gets the jump on the outside. He jumps to the bottom into turn 1. Allgaier is coming on the outside. Allgaier has a run on him down the back. Allgaier fakes to the inside, Dillon blocks the bottom. Allgaier drives by on the outside. Ty Dillon gets him back with a returned outside move. Lap 18, Allgaier has Cole Custer on his bumper a toe draft on Ty Dillon. He caught the leader heading into turn 3, Allgaier cuts to the bottom, new leader. Caution, there’s a car stopped on track. Green, Allgaier gets the jump on the outside. They fan out three wide for 2nd. Allgaier leads by 4 car lengths off turn 1. They’re still side by side for 2nd. Ty Dillon is three wide and in the middle into turn three. Dillon is sideways in front of the field! Elliott Sadler comes along with nowhere to go, he clips Dillon and they both head toward the outside wall. Green, Cole Custer noses ahead of Allgaier on the bottom into turn one. They run side by side down the back, trading side drafts. They’re three wide behind them for 3rd. White flag on stage 1, the second row is looking to steal the stage win. They’ve got a run, they split the front row. John Hunter Nemechek heads to the bottom, Preece heads to the top. Four wide down the front stretch! 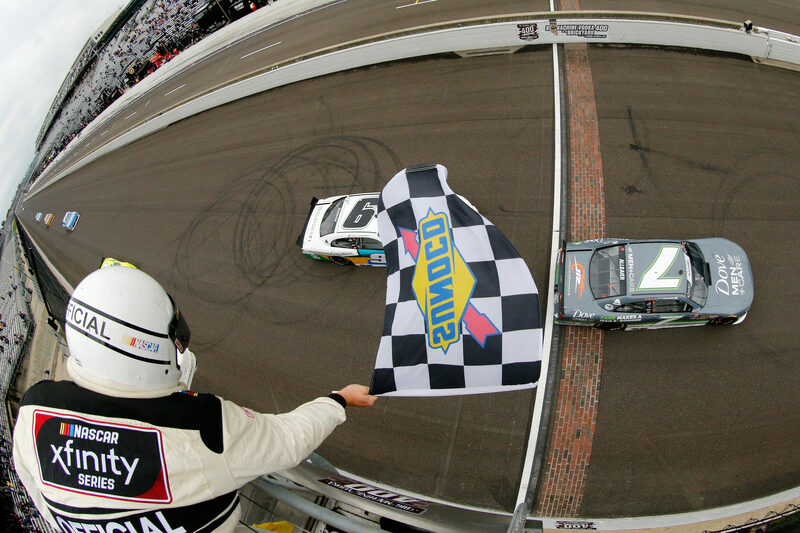 John Hunter Nemechek wins stage 1 at Indianapolis Motor Speedway! The field heads for the pit lane. Brandon Jones wins the race off the pit lane with two tires. Matt Tifft stayed out on the track. Green flag, Reddick gets the push from Hemric on the inside. Reddick leads off turn 1. Tifft has a huge run down the back, Reddick throws a block. Lap 38, Hemric has a run on Reddick. Austin Dillon pushes him on by as Reddick falls to 3rd. Lap 50, Hemric and Dillon have broken away from the field by 1.5 seconds. Christopher Bell runs 3rd. 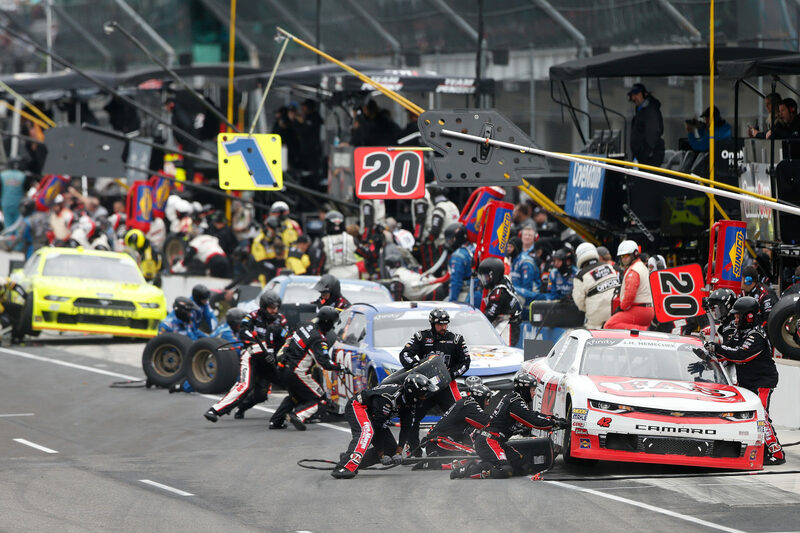 3 to go, Austin Dillon heads for the pit lane. 3 to go in stage two, multiple cars head for the pit lane. Reddick, Blaney, Tifft and more. Blaney gets handed a speeding penalty. Daniel Hemric cruises to the win in stage two! Most of the field heads for the pit lane. Four tires and fuel for all. Allgaier leads Hemric off the pit lane. Several cars stayed out. Green flag, Dillon noses ahead. Tifft fights back on the bottom. The leaders run side by side for the entire lap. Chase Elliott pushes Tifft to the lead as they come back to the line. Lap 71, Elliott looks to the inside, Tifft blocks. Elliott swings to the outside into turn 1. It was likely a fake. Elliott leads off turn one. Tifft has a run off turn two, Tifft looks to retake the lead. Elliott has help, he gets a huge push as he maintains the lead into turn one. Tifft is hung out to dry, he falls to 4th. Cole Custer throws a block down the back stretch. It’s too late, Brandon Jones is under him. Custer is hooked toward the inside wall. The car is torn apart in the wet grass. He bounces off the inside wall and comes back across the race track. The field snakes around him. The caution is out. Green, Elliott leads on the bottom into turn one. Ryan Preece is around off turn two! He slides to the infield and makes heavy contact with the tire barrier. The red flag is out. Preece pinched Nemechek into turn two, they ran out of space. Preece went around in front of the field. Green, Elliott gets a push from Allgaier on the bottom into turn one. They all have a run on Elliott down the back. They run three wide for the lead into turn three. Just Allgaier leads, Reddick runs 2nd. Elliott falls to 5th. 15 to go, Christopher Bell has a run on the leader. He looks to the outside. Allgaier and Bell run side by side through turns three and four. Reddick gives a push to Allgaier and pushed him back to the lead. 10 to go, the top five cars run nose to tail at the line. Allgaier leads Reddick and Elliott. Every lap, Allgaier pulls ahead through the corners. Reddick then drafts back to him down the long straightaways. The lead might not be the place to be on the final lap with these aero ducts. Reddick isn’t trying to push, he just shoves Allgaier ahead at the end of every straightaway. 5 to go, Allgaier leads Reddick, Blaney, Elliott and Hemric. The top five cars have broken away and run nose to tail. 3 to go, still nose to tail, no movement. 2 to go, Allgaier runs the inside wall heading into turn one. He’s blocking the huge run from Reddick. 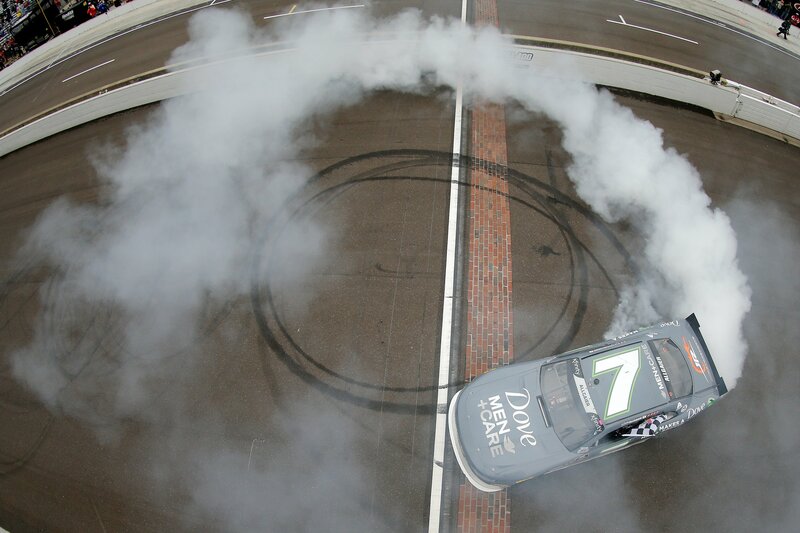 Same thing down the back, it’s a Daytona line at Indianapolis. 1 to go, Allgaier leads by a car length at the line. He leads by two off turn one. Three off turn two. Reddick is closing down the back, he looks to the inside. Allgaier blocks it. Reddick has a run coming to the line but he has no help. 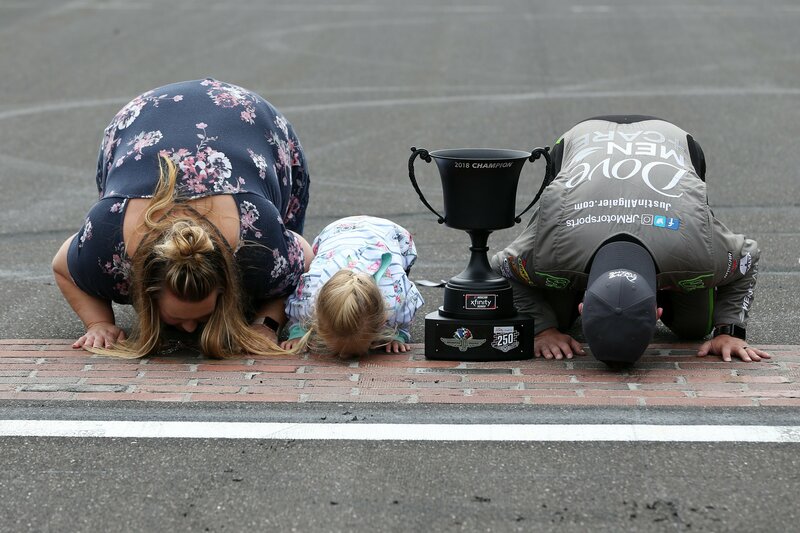 Justin Allgaier wins the NASCAR Xfinity Series race at Indianapolis Motor Speedway! 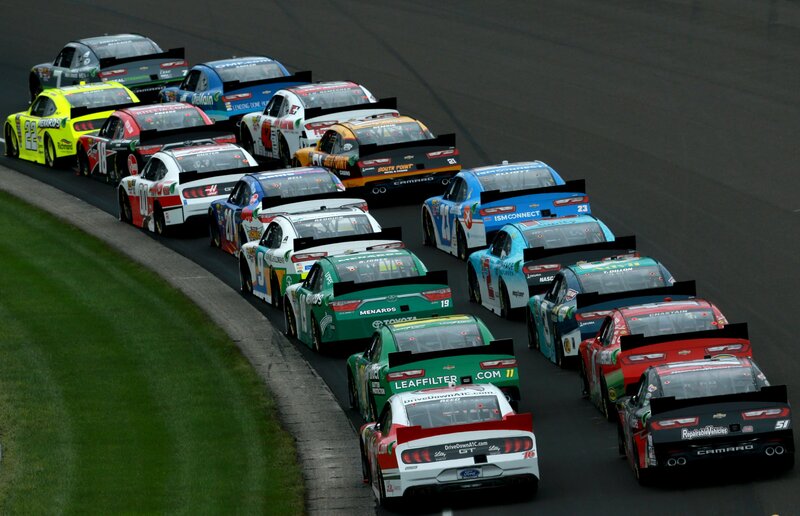 View full Indianapolis Motor Speedway race results from the NASCAR Xfinity Series race below.